If you own commercial or residential property in Westchester County, Yonkers, or the New York City area, it’s important to understand that poor restoration following a flood or other forms of water damage can seriously harm the value of your property. We offer expert service for safely drying, deodorizing and disinfecting the areas flooded or damaged by water. Don’t settle for so-so service, call Hi-Tech Cleaning Services and protect your investment. 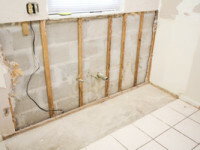 Our fast and efficient flood remediation service is available seven days a week, 24 hours a day. First responders will get to the emergency within two to three hours. A full response team, together with state-of-the-art equipment, will arrive within 12 hours. Professional supervision and accurate, detailed records will be maintained until your property is restored to its normal condition. Hi-Tech uses the most up-to-date water removal equipment, including moisture detectors, hygrometers and other meters to measure the extent of moisture saturation, as well as submersible and gas-powered pumps for continuous pumping of high-level water. Removing water is just part of the restoration process. Hi-Tech’s experts use sanitizing agents, germicides and anti-microbial treatments to make sure your home or property is safe. Our deodorizing products control odors produced by excessive moisture, while disinfection products stop the growth of bacteria, fungi and mildew. We use High Drying equipment to prevent property water damage like swelling and warping of floors, walls and furniture. Our industrial grade dehumidifiers minimize secondary water damage and high-speed air movers create airflow across walls, carpets, pads and furniture, quickly evaporating moisture and helping prevent the damage caused by exposure to moisture. Contact us online 24/7 or call (914) 423-4600 to learn more about our emergency water damage removal services, specialty cleaning, and stone and tile restoration in Westchester County, Yonkers and the NYC Area.